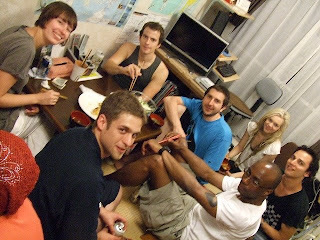 The other night, I held a Tempura party at J-hoppers Hiroshima. So many guests joined in it and the room was full of hungry people! Tempura is a classic Japanese dish of deep fried lightly-vegetables and seafood. 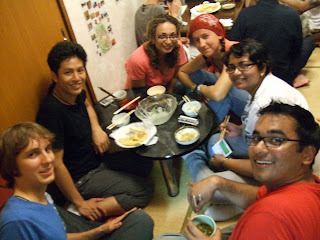 We also served Somen noodles too. They are very thin white noodles and often eaten in summer time. All the guests seemed to be enjoying the food and meeting new people at the party. 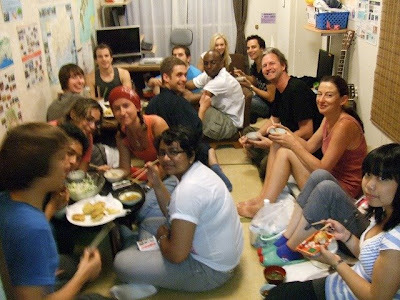 It's always by chance that people from all over the world stay here this small hostel at the same time. I think meeting new people is one of the most fun parts of travelling. I would love to have these kinds of parties more to make opportunities for people to enjoy the time here and share it with people. 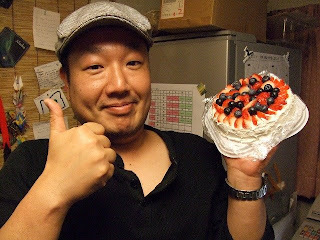 it was Tsuru-san's 35th Birthday!!!! He's a night staff and It's been only few months since he came to this hostel, but he's a big part of J-hoppers Hiroshima already! He's funny and worm-hearted person. 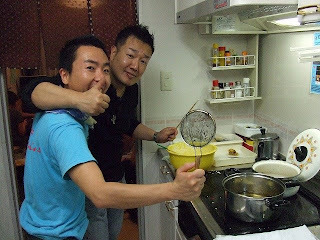 Also he's a great chef and always make us happy with his great delicious food!!! Are you hungry?? Come to J-hoppers to see him!